After the amendments to the Income Tax ordinance 2001 regarding property taxes were announced, the general expectation was that the property prices would see a massive downward trend and the market would lose its vitality. This apprehension did not materialise fully, however, and fortunately no jarring plunges were seen in property prices in Lahore, Islamabad or Karachi during August 2016 according to Zameen.com statistic. But no notable upward activity was witnessed either, and transaction volumes - which had hit rock bottom in the weeks immediately after the new taxes we announced - did not see much of a recovery. 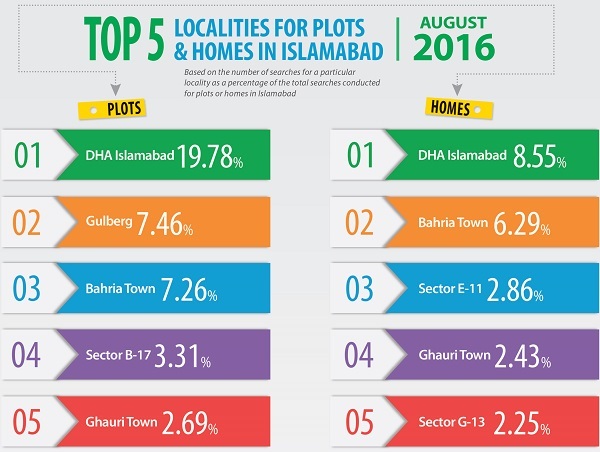 Plot prices in Lahore showed stability in almost all major localities. 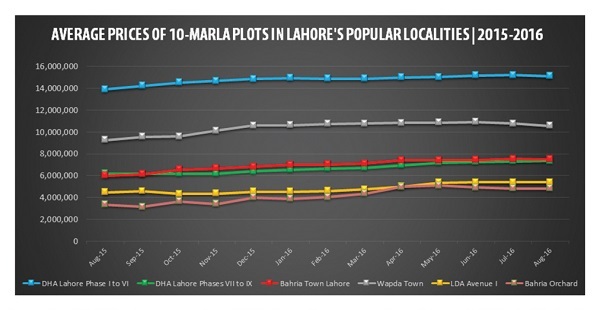 According to Zameen.com’s stats, DHA Lahore’s Phases I to IX registered stable numbers for both 10-marla and 1-kanal plot categories. Other major localities including Bahria Town, Bahria Orchard and LDA Avenue I also remained stable in terms of property values, signifying that the realty market of the capital city of Punjab has borne the impact of the taxes as well as it could have. Prices in the federal capital were also not too harshly affected by the new tax regime. 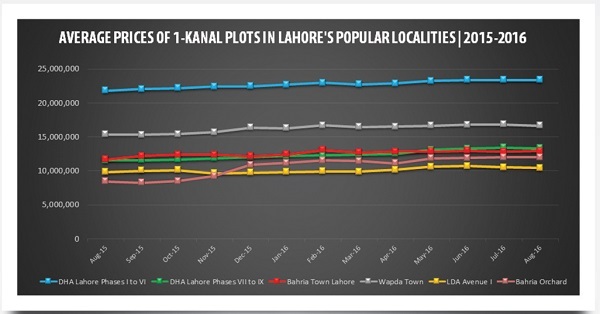 For 1-kanal plots, stability was the order of the day for all prime housing projects, with the only exception being Sector B-17, where a controlled drop in prices was seen. 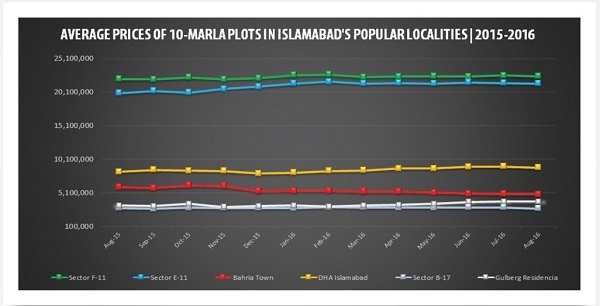 The 10-marla plot category, on the other hand, performed rather sluggishly with Sector B-17 registering a sharp drop in prices. After the implementation of new property taxes, the realty market of the city by the sea, Karachi, posted mixed numbers. Fortunately, August 2016 didn’t see any major drops in prices in the city's top localities. 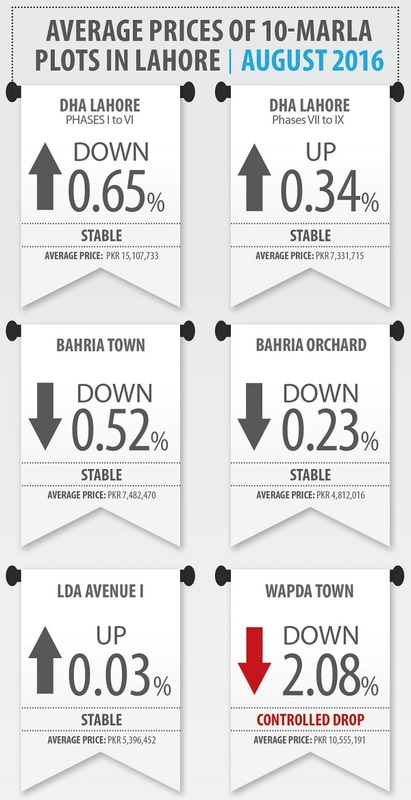 The average value of 10-marla plots in Bahria Town Karachi increased 1.15%, while DHA City Karachi (DCK) witnessed a price drop of 1.20%. Overall, the situation remained somewhat stable in terms of property price fluctuations. Rumours that prices dropped by an average of 20% were not confirmed by Zameen.com’s data, but market activity was largely steered by genuine buyers in the absence of investors. 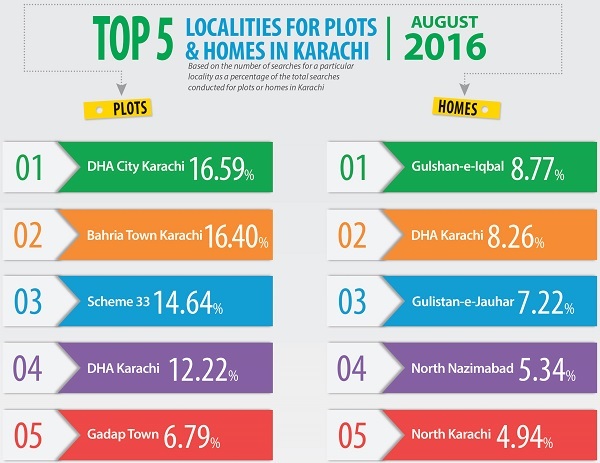 DHA’s projects topped our charts of top 5 localities for plots and houses across the board, the only exception being Karachi’s home category, in which Gulshan-e-Iqbal Town knocked DHA Karachi down to second place. 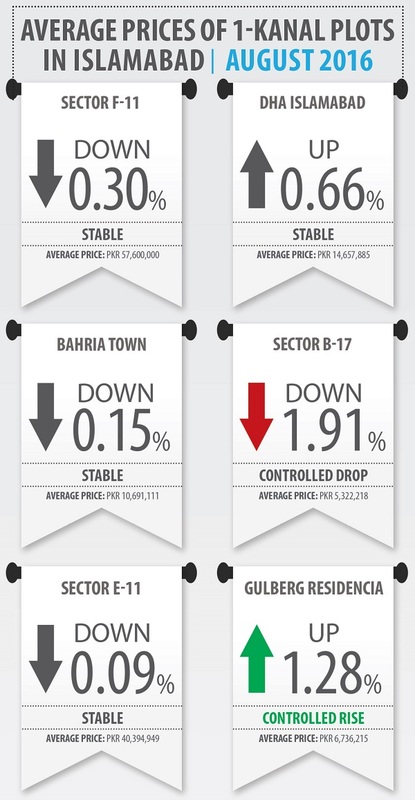 Though there has been an apparent drop in sale-purchase activity in the property sector of Lahore for the last couple of months, price trends remain stable. DHA, which is one of the top investment options in Lahore, witnessed stability for all plot categories in August 2016. 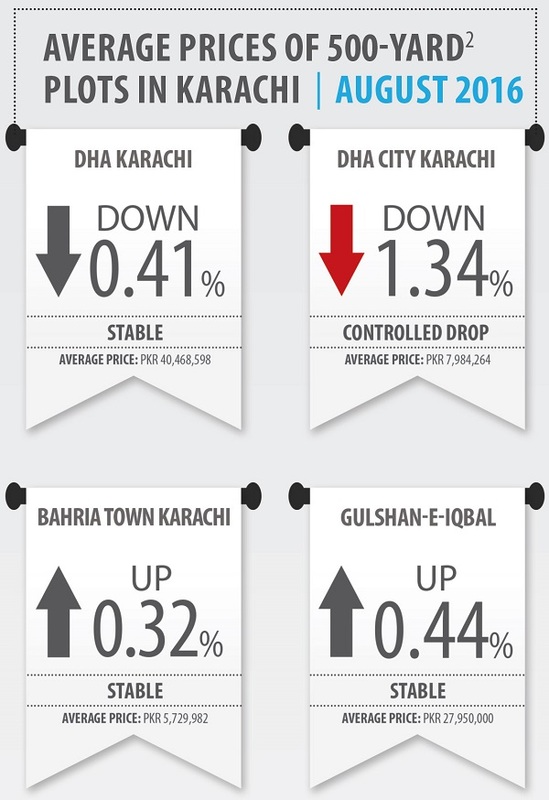 Fortunately, prices did not drop sharply in DHA’s projects. One of the most sought-after among investors, Bahria Orchard was also not impacted too negatively, with both 10-marla and 1-kanal plots registering negligible drops of 0.02% and 0.23% respectively in property values. 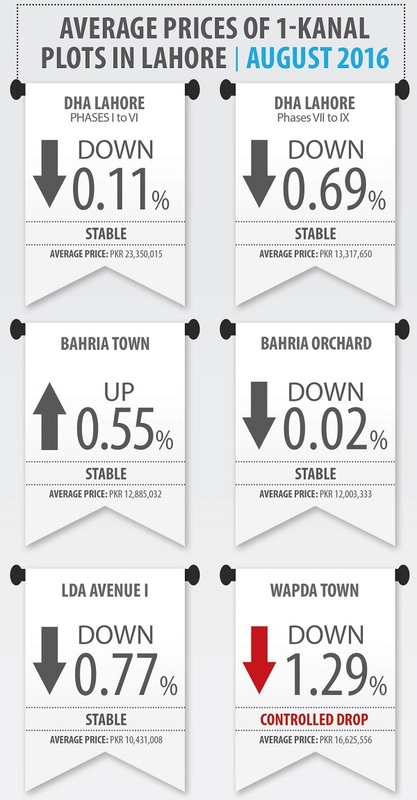 In case of Bahria Town proper, an increase of 0.55% was registered in the 1-kanal plot category, however, a small drop of 0.52% was seen in the value of 10-marla plots. Even in the case of LDA Avenue I, stability was the order of the day, while prices in Wapda Town dropped in a controlled manner. 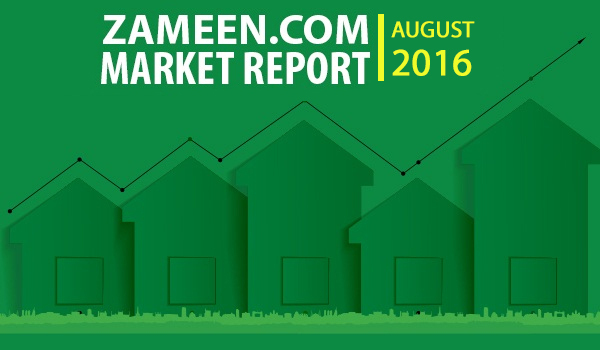 Islamabad’s realty sector remained steady during August 2016. Though some drops in property values were seen here and there, there were no major dips overall. 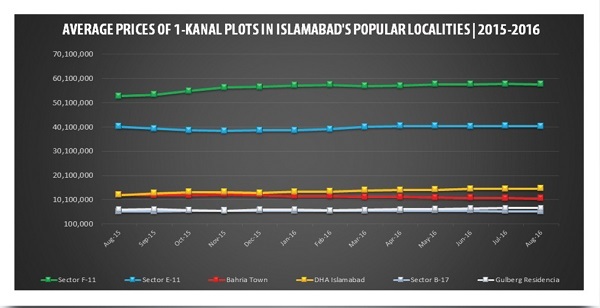 DHA Islamabad, which remains a centre of attention for both local and overseas investors, showed stability, with a 0.66% increase in the value of 1-kanal plots. 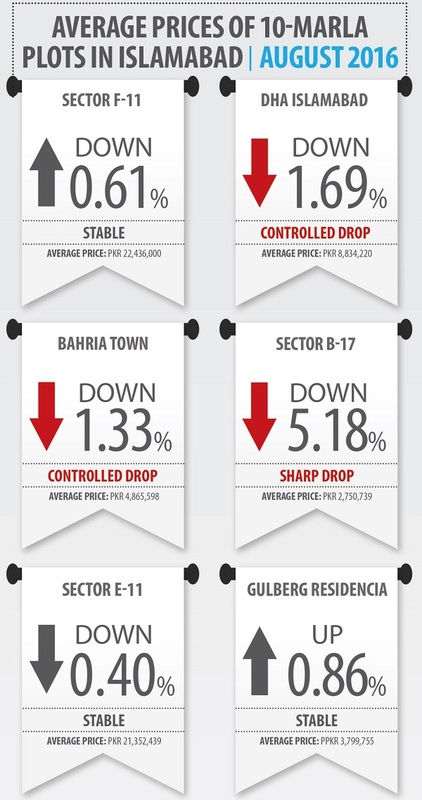 In case of Bahria Town, price drops of 0.15% and 1.33% were seen in the respective plot categories of 10 marla and 1 kanal. Sector F-11 and Sector E-11, on the other hand, clung on to mere stability in August 2016. 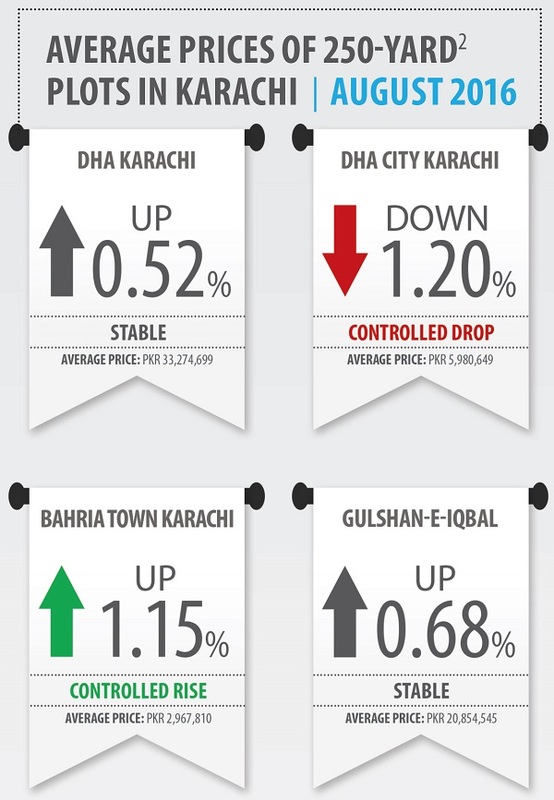 In Karachi, investors are generally drawn to DHA Karachi, DHA City Karachi (DCK) and Bahria Town Karachi (BTK). These three localities are also sought-after by genuine buyers wishing to own a home in a peaceful environment in the city. 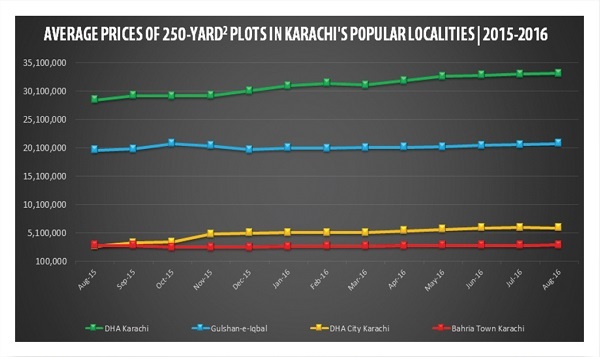 According to Zameen.com’s stats, property prices in DHA Karachi remained unchanged, with a 0.52% increase registered for 250 square yard plots and a trivial drop of 0.41% for 50-square yard plots. DCK, which has been performing impressively from the get-go, registered controlled drops in property values during the month. BTK and Gulshan-e-Iqbal, on the other hand, posted slight increases in the values of 500-square yard and 250-square yard plots. 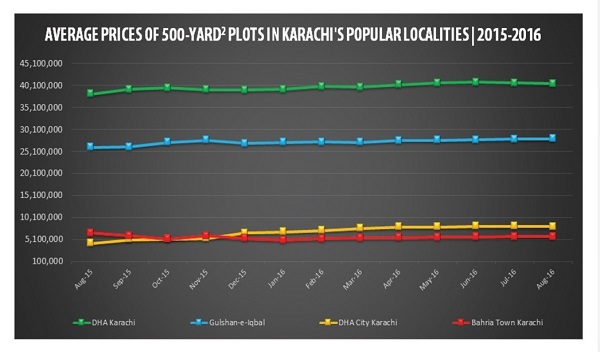 Despite all the controversies which affect the sale-purchase activity in BTK from time to time and the new tax regime, price trends in the locality continued to look up, as prices of 250-square yard plots in the locality increased 1.15% during the month. The new tax regime has adversely affected market activity, with investors and even some genuine buyers preferring to wait in the face of an uncertain tax environment that is still not completely understood by many. It is true that property buyers and sellers will now have to pay an increased amount of taxes on property transactions, however, the highest percentage of tax that a returns-filing buyer will have to pay in Pakistan is not more than the 4% tax that needs to be paid on a property transaction in Dubai, for instance. The property markets of Lahore, Islamabad and Karachi have not witnessed any major drops in property values after the implementation of the new tax regime. In fact, the prices have remained largely stable. While this increase in property taxes will keep property flipping at bay and speculative trading in the market will come to an end, there is no denying that market activity and transaction volumes have taken quite a hit. Overall, August 2016 has been a predictably slow month for the property sector. Let’s see how the future unfolds for the real estate sector in Pakistan.